Students and faculty at Indiana State University are working with city officials and the Vigo County Health Department to help keep children safe from a threat common to older communities such as Terre Haute. Nursing students test children's blood for lead poisoning while earth and environmental systems students test soil for lead contamination. "Any amount of lead in the body of a young child is a health risk," said Esther Acree, associate professor of nursing and director of the Sycamore Nursing Center. "The effects can be devastating, leading to permanent loss of IQ, developmental challenges and the potential for violent tendencies." In 2012, the Centers for Disease Control and Prevention cut in half the threshold for determining lead poisoning in young children. In announcing the new standard for persons under 6, health officials said the change means as many as 1 million children nationwide could now be diagnosed with the condition that can permanently damage developing brains. That's a fourfold increase from the number of preschoolers believed to be at risk under the previous standard. While Indiana has yet to adopt the new standard of 5 micrograms of lead per deciliter of blood statewide, some local health departments, including Vigo County, are following the new guidelines. City officials say about one-half of all homes in Terre Haute were built before 1950 and pose a risk from lead-based paint, which was banned for U.S. homes in 1978. Since 2004, junior-level nursing students have conducted lead screenings at Locust Street IGA, the Sycamore Nursing Center, at Head Start, and at community health fairs. The health department provides nursing students with hands-on training in the prevention, treatment and follow-up for lead poisoning, said Joni Wise, department administrator. "Lead poisoning is entirely preventable. The key is stopping children from coming into contact with lead and treating children who have been poisoned by lead," Wise said. Student nurses work with the department on case management for children. They also help educate parents, guardians and caregivers on how to prevent exposure, Wise said. The health department estimates about 1,100 Vigo County children are screened each year with more than 11 percent testing positive - a rate twice the state average. In recent years, faculty and students in the department of earth and environmental systems have become involved by testing soil samples throughout the city. "There are some areas that have elevated levels, there are some that don't," said Jennifer Latimer, associate professor of geology. "There are ... brick homes that have elevated lead levels in their yards whereas homes that were probably painted with lead-based paint at some point don't have elevated levels so it's highly variable." 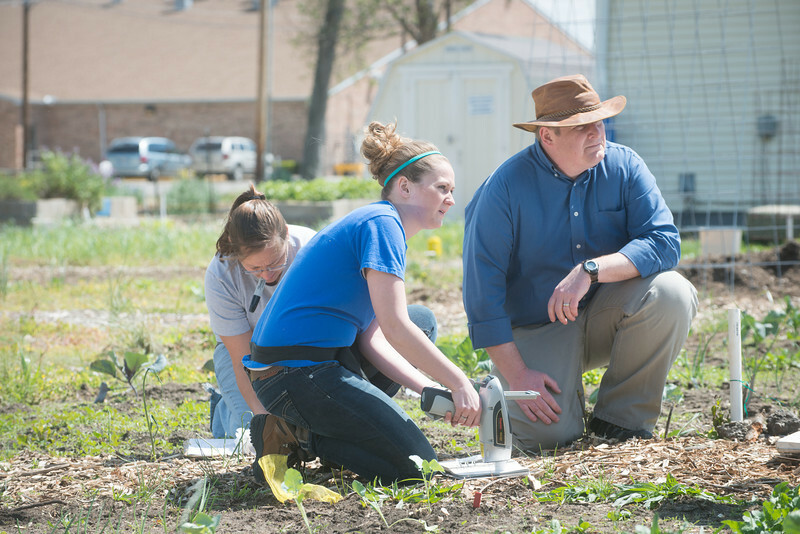 Last year, students took soil samples from the Terre Haute Community Garden, located on university-owned property east of campus where several older homes once stood. As with previous studies, the results varied widely. Gardeners who grow food not only for their own families but also to donate to local food banks - a requirement for staking out a plot at the community garden - welcomed the testing. "To know specifically whether one's individual plot was heavy in lead or not is something that's very valuable to have," said John Halladay. "You can either plant different crops there or do various kinds of emendations." Joey Pettit, a Ph.D. student in earth and spatial systems, tested soil from outside the Early Childhood Education Center at University Apartments and found no lead problem. City officials plan to use the results of ISU students' tests to help create a map identifying at risk areas. "It makes me feel quite good" to have played a role in the ongoing effort, Pettit said. "Some of the lead testing ... goes to the city planner. He then knows a little bit more about what is going on ... and he can make decisions based on that information." The department of earth and environmental systems offers free soil testing to residents who want to participate. If tests find high lead concentrations in yards or gardens, faculty will provide recommendations for managing the situation. Interested person may request information at ISU-Lead@mail.indstate.edu or through the Institute for Community Sustainability. In collaboration with the institute, Wabash Valley Master Gardeners Association and the Purdue Extension Office, the department will also offer safe urban gardening workshops during the gardening season. The first step in treating lead poisoning is to remove the source of the contamination or seal lead containing products, such as paint, Latimer said. Lead in soil generally does not pose a threat unless it is disturbed or if it becomes airborne. Children are more susceptible to lead dust exposure because of their hand to mouth behaviors and ingestion is a common route of exposure, she said. "That's probably one of the biggest problems we have," Latimer said. "Studies have shown that kids actually have elevated levels of lead in the summer just from playing outside because there's more lead dust in the atmosphere." The best way to prevent lead in soil from presenting a health risk is to keep it covered with mulch or vegetation. Gardeners should be sure to thoroughly clean and peel vegetables before eating and avoid tracking dirt into the home. Also, cleaning floors with a wet cloth or mop is preferable to vacuuming, Latimer said. Nancy Rogers, associate vice president for academic affairs and director of Indiana State's Center for Community Engagement, said the lead testing and education work of students and faculty is a prime example of how community-based research and service benefits both students and the community. "Some families would not even know if their children had elevated lead levels in their blood if it was not for the testing that our students provided, Rogers said. "My hope is that we can continue to work with community partners to build on this important work." As part of the Indiana State University College of Arts and Sciences "Our Town" Community Semester, Professor Latimer will discuss "Urban Lead: The Legacy of Leaded Gasoline, Lead-based Paint and Coal" during a Science Café event Feb. 23 from 9:30 - 11 a.m. at Clabber Girl, 900 Wabash Ave. in Terre Haute. Note: This report was condensed from an article in the winter 2012 issue of Indiana State University Magazine. Photo: http://isuphoto.smugmug.com/Other/ISUphotoservices/Faculty-photos/i-G5GPfkS/0/L/04_23_12_commercial_shoot-0571-L.jpg - Indiana State University students Heather Foxx and Ashley Burkett work with Jim Speer, professor of earth and environmental systems, on testing soil at the Terre Haute Community Garden. 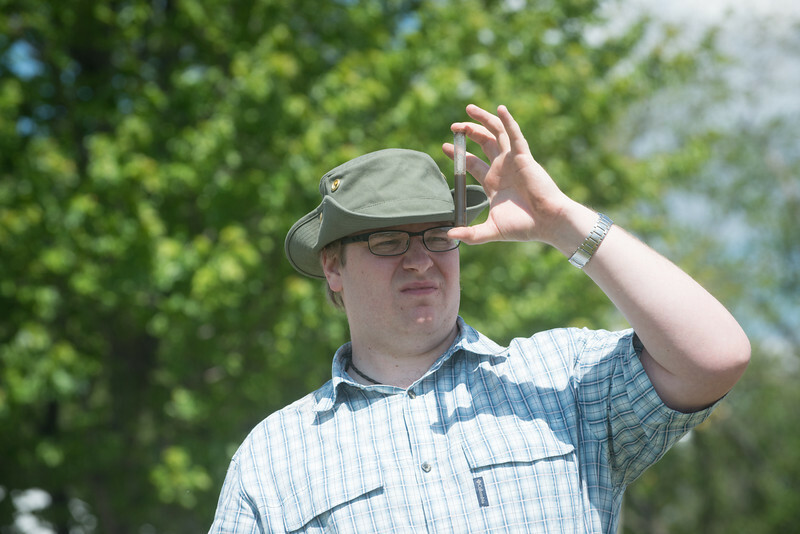 Photo: http://isuphoto.smugmug.com/photos/i-8m7rjzq/0/L/i-8m7rjzq-L.jpg - Kyle Burch, an Indiana State University graduate student in earth and quaternary sciences, examines a soil sample. ISU students and faculty are working with Terre Haute and Vigo County officials to address a health concern common to older cities - that of lead poisoning.